In a globalized world, where mobility is facilitated, learning a language is a wonderful benefit. It has become more than just a boost to your CV or handy for travelling today. Not only does it make you smarter and more decisive, it is also a great advantage for studying in general and for career prospects abroad. As our world becomes more and more connected through technological advances, it’s becoming increasingly obvious that learning another language is beneficial. Chinese is considered as the most widely spoken language in the world. Each year millions of people travel to China to experience its rich culture, walk the Great Wall of China, explore its shrines and indulge in its wonderful cuisine. Ravidini Senananda started her stint with the language because of her passion for Chinese martial arts. The 19 year old who hails from Musaeus College, Colombo, had begun training in wushu from a tender age. After taking part in the Seventh Junior Wushu Championship which was held in China she realized the need to learn the language if she wished to excel in the sport. “It started as a means of paving the way to success for my flair for wushu but I started to fall in love with the language. It is so unique and beautiful,” she said adding that she had gotten several opportunities to translate for Chinese coaches who had conducted workshops in Sri Lanka. She notes that the starting point has been difficult because the language has been quite alien to her but nothing is impossible if you possess the determination. “At the beginning I had to master the Pinyin alphabet. Pinyin helps us to read and pronounce Chinese characters. The Chinese language has five tones and if we can’t use the tones correctly, then the Chinese people wouldn’t be able to understand what we say. Even though writing hanzi (Chinese characters) seems to be difficult, it is much easier than speaking Chinese,” Ravidini explained. 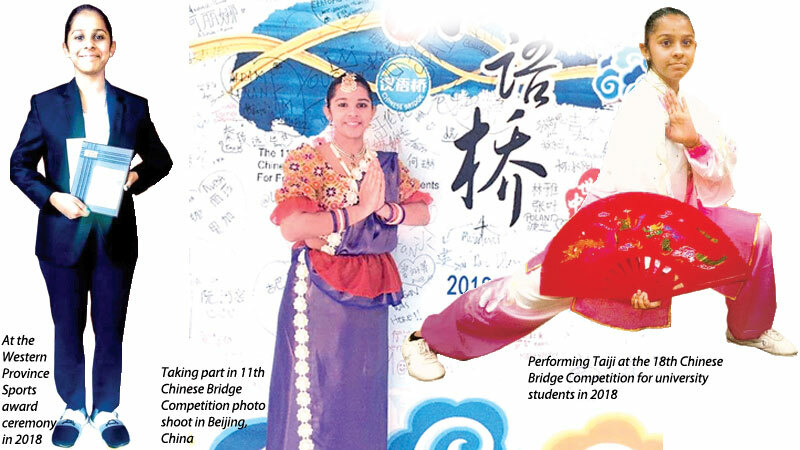 Ravidini took part in the 10th Chinese Bridge Sri Lanka Zonal Competition for secondary school students in 2017 and was placed third in the performance category. She won 10th place in the overall competition and got the chance to take part in the 10th Chinese Bridge Summer Camp held in Yunnan, China. She was awarded as an outstanding camper at the event. The following year too she took part in the 11th Chinese Bridge Sri Lanka Zonal Competition for secondary school students. This time she won first place in the performance category as well as the speech contest. She bagged third place at the written exam and topped the overall competition. She flew to China to take part in the 11th Chinese Bridge Final Competition. The Sri Lankan team, clinched the 11/25 place (Asian region). Ravidini says that she enjoys writing Chinese characters because it relaxes her mind. The most challenging aspect of the language is to speak Chinese by using the relevant tones. “There are some similarities between Chinese, English and Sinhala. The sentence pattern is subject, verb and object (SVO) in English. The Chinese sentence pattern is the same. The Sinhala language has a section called ‘Ruwan Waki’. Chinese uses a similar category called ‘Cheng Yu’,” she said. Recalling her first experience in taking part in a Chinese language competition Ravidini says that her teacher, Navindi Wickramasinghe encouraged her to apply for the event. “They select two students from zonal competitions to represent Sri Lanka at the Chinese Bridge Final Competition which will be held in China. The 10th Chinese Bridge Competition was held at the BMICH on July 16, 2017. The competition comprises of three categories: written, speech and the and The Chinese Cultural Talent Show. One must top the grades in these competitions to be selected for the final competition. About 50 students took part in the zonal competition,” she reflected. Around 52 students from 14 countries in South Asian and East Asian secondary schools took part in the camp. “I learned a lot about the Chinese culture and language during the camp. The most memorable experienced I had was teaching Taichi for Chinese students and campers. 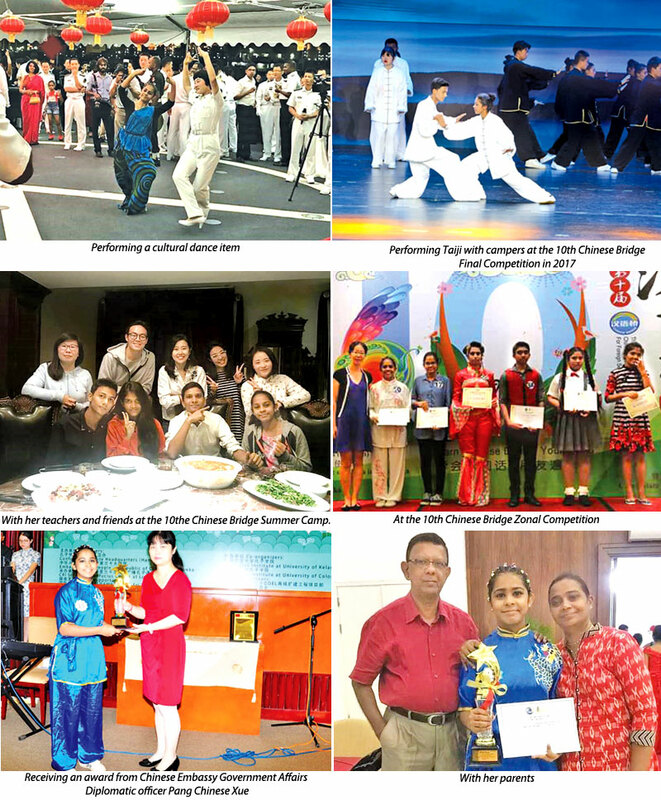 We all performed a Taichi event at the 10th Chinese Bridge Final Competition,” Ravidini expressed. Around 200 students from 102 countries were present at the 11th Chinese Bridge Final Competition. Ravidini joined the team while preparing for her Advance Level examination that year. However she thoroughly enjoyed the experience and formed some strong ties with Norwegian and Croatian students. “The Confucius Institute gives the finalist of the zonal competition a six month scholarship to study in China. However we must apply online for Confucius scholarships and have to get selected for a university. I got selected for Beijing Normal University to study Chinese language and literature. I am heading there for the Spring semester which will be starting on February 22,” she enthused. Some of her other future plans concern continuing with wushu along with her higher studies. She aspires to be selected for the senior wushu team in the country. “Learning another language is always a good investment for your future. It helps us to be unique and to understand other cultures. You will feel proud when you understand another language which many others might not have mastered. Since our country is rapidly expanding in the tourism sector, learning a foreign language has a lot of benefits. Try to learn another language and discover the beauty of different cultures around the world,” Ravidini opined.